You’ve been waiting for this Nanoil hair oils review for a very long time. In fact, I will focus on one of them – Nanoil for medium porosity hair that I’ve been using for 2 weeks now. I will give you extra info about the other two oils in the annotations. Nanoil for medium porosity hair. Why this one? · Nanoil for high porosity hair. We identify our type of hair porosity! I simply observed my hair. I knew my hair problems and compared them with the characteristic of each porosity type. It turned out that my hair – frizzy, prone to splitting and breakage, quite stiff, unnaturally curly and dull – has medium porosity. This hair type needs reinforcement, protection and improvement in the appearance. Can Nanoil hair oil provide it? Hair porosity can also be defined when we check the ability of our hair to absorb water. You must have read about a popular water glass test. We put a hair in a clean water and observe how quickly it sinks to the bottom. However, this method won’t give you reliable results. We should go to a hairdresser who is a hair expert. – macadamia nut oil that brings back vitality and softness. · anti hair loss Kerastim. The product is free from silicones, parabens and alcohols. There’s no point in looking for harmful ingredients – Nanoil has none of those. The brand values the quality so we get an ideal, all-natural and lightweight product. In my opinion, it is heaven for hair captured in a tasteful black bottle. The two other versions also include argan oil, maracuja oil, vitamin E, UV filter ad substances for strength and growth. – Nanoil for low porosity hair also contains: cedar oil, coconut oil, castor oil, babassu oil, monoi oil, shea butter, cupuacu butter, panthenol and vitamin A. – Nanoil for high porosity hair also includes: almond oil, evening primrose oil, avocado oil, cottonseed oil, panthenol, keratin, silk and lanolin. It’s easy to post an opinion without even knowing the product but I decided to do it right and tested one version of Nanoil hair oil. Why only one? It is logical because only one version is suitable for the structure of my hair. I’ve been using the oil for about two weeks. Although the manufacturer promises the effects after 30 days, I’ve already noticed a big difference. My hair is less frizzy and static, it’s soft to the touch and silky smooth. Beautiful waves fall on my shoulders. I used to have a problem with hair falling out in handfuls. Now, the problem is gone. 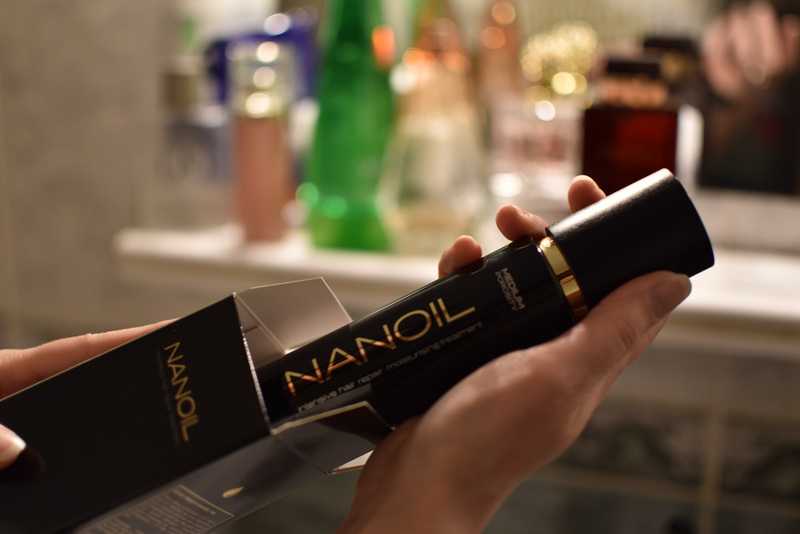 I’m no longer afraid of using a flat iron because I know that Nanoil hair oil protects from the heat. Styling a hairdo takes less time – hair is manageable and dries more quickly. The aroma is pleasant, delicate, very fresh and long-lasting. The consistency doesn’t resemble natural oils. Nanoil hair oil is lightweight, instantly absorbed, non-greasy and non-overburdening. The design deserves a separate paragraph because Nanoil hair oil looks really impressive. It comes in a black narrow and heavy bottle. 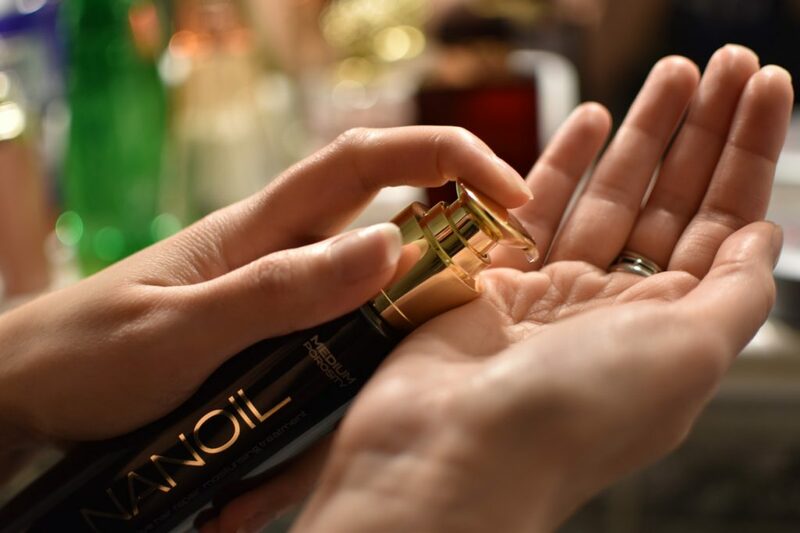 Although greasy finger marks stay on the bottle, it still looks very elegant. The combination of blackness, golden elements and wooden cap. Beauty! I must also evaluate the practicality of the bottle. It is very handy. Unfortunately, we won’t put it in the hand baggage because of its size and weight. The wide pump is very comfortable. You don’t even have to pick up the bottle to apply a suitable amount of the oil. The price could be lower but I’m aware that we must pay for the quality. The amount I paid for one bottle is not exorbitant. Nanoil is worth buying. The availability is another good side of Nanoil hair oils. They are sold online. You buy the oil and it arrives at your door after just 2 days. I once looked for various hair care methods and found some vlog where a girl was introducing hair oil treatment and was very och and whoa about it, I start digging for oils to try with my hair and I bought Nanoil. I couldn’t get better than this. I thought that the praise over the hair oil treatment is made into too much of a deal, but no! I didn’t think that my hair can change to this level. Try it! I keep on changing my hair colour from dark to blonde, so its condition is pretty bad: matte, split ends, in general awful. Have any of you had this problem and this oil helped her? I used shampoo and conditioner of a well known brand. Total failure. Hair was super dry and it was hard to brush it. Today, for the first time I used nanoil and i’m curious whether it’ll help. First impression of mine is that the scent is great and subtle and hair is soft. We’ll see what’s ahead. I had enormous problem with hair loss, everyday my brush was covered with handful of it, every morning I found on my pillow plenty. I took all sorts of dietary supplements and vitamins. Helpsed me only on the short run. Or my hair stopped falling out, but were very thin. I came across some article about Nanoil and I think it is the best thing that happened to me! Never before have I had such a thick and beautiful hair. for me best thing about this oil is that I can apply it not only on hair but also on scalp. I cango on with some nice head massage and do not have to be careful while at it. This makes also application easier. Most oils can be put only on the hair, or so i’ve heard. Regular use of conditioner and hair mask was never even close to help me as much as this oil did! Now I can use only shampoo cause hair is easy to comb. My friend send me an article about nanoil and bought it. I expected more. As far as for my friend, her hair is thicker and VERY shiny, mine just not fall out and maybe is easier to style.. I thought for this amount I get something more..
Oh come on, oil must be making hair greasy, isn’t it?? probably depends on hair and how quickly you can get there…. since I use it besides change to appearance I noticed less problems with irritated scalp. Earlier every colour treatment, even with gentle dyes equal unpleasant prickling and burns. I got this impression as not only my hair is stronger but my skin too. not for me, obviously! Hair may stop fall out but hair is heavy from the oil. Perhaps I chose wrong oil for my hair type.. I have nanoil for low porosity hair and its awesome. No everday hair wash ever again. Ramona, go to the website, there you have everything explained, there is only 3 so you can manage, I’m sure ?